This podcast is titled "Duty and Power of the Church" and is part 1 of 3.
Who are the former Amish? The Amish church rarely accepts them as they are. They have a hard time seeing themselves as English. So who are they? Misfits? Most times, the hurt, confusion and feelings of rejection leak further then just one or two generations. John Bouquet is the senior pastor at Bethel Baptist Church in Savannah OH. For more than 30 years, he has preached the gospel and discipled Amish and former Amish. In this message at the 2015 Amish Awareness Conference, he shares what that has looked like over the years. What can the Amish people learn from the English? During the 2015 Amish Awareness Conference, the English asked the former Amish discussion panel various questions about life. What can the English people learn from the Amish? During the 2015 Amish Awareness Conference, the former Amish asked the English discussion panel various questions about life. What is the best way to connect with Amish and former Amish people. Listen to people from a non-Amish background share their encounter and ways of connecting with the Amish and former Amish. Kidnapped from a Kmart parking lot, Margy Mayfield spent the next 10 hours with a violent and dangerous criminal. 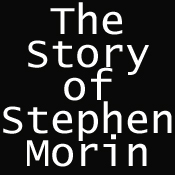 Stephan Morin had never known anything but driving hatred, until he experienced the love of Christ. What happened on their journey is nothing short of miraculous! Focus on the Family. April 02, 2003 Your browser does not support the audio element.